Creating a beautiful and functional landscape design can have its challenges. One person may be a visionary and see a landscape design come to life immediately, while others need to sit down, think and conceptualize. There is a lot of planning involved in creating a landscape design, one of the first steps is choosing the elements you’d like in your landscape. Many elements can affect how guests and homeowners move about a space and drastically impact how a space feels. Here are a few of the most common landscape elements to consider in your design. When creating a landscape design, patios are one of the first elements people think about. What people rarely consider though, is how much a well-designed patio can lend itself to a space. The design of a patio should consider the style of the house and the existing softscape, always complimenting one another. Patios are the workhorse of outdoor entertaining. For example, if your landscape design purpose is outdoor dining, the patio space should be close to the house, increasing its likelihood of being used. Patios that are farther from the house are better suited for a quiet reading area, or a fire-pit. Other aspects to consider when designing a patio are, sun exposure, sound, wind and privacy. You will want to make sure your patio is not over-exposed to the sun or neighbours! Much like patios, decks are also a very common design element. 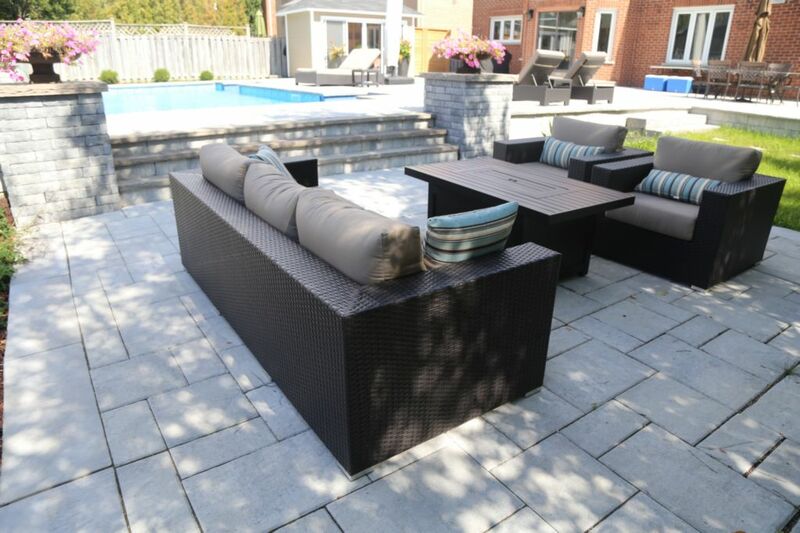 Serving many of the same purposes as a patio, they are great for entertaining and adding interest to your space. If your home has a lot of drastic grade changes, or you must walk down quite a few stairs from your back door to your yard, a deck may help solve those problems. Like the patio though, you must still consider aspects such as, sun exposure, wind, sound and privacy. Retaining walls are a “hybrid” element of landscape design. This is because they serve more than one functional purpose. A retaining wall can be used for structural purposes, such as, holding back soil and dirt to create a more functional patio space. Alternative, they can also be used strictly for design purposes, meaning they are not retaining any earth but used to separate other landscape elements and add visual interest. Retaining walls can be used to create a raised planting bed or to help breakup a yard with a steep slope. No matter the application, retaining walls require a higher amount of design and engineering to ensure longevity and an attractive finish. Water Features can be a calming and relaxing element to add into your landscape design. 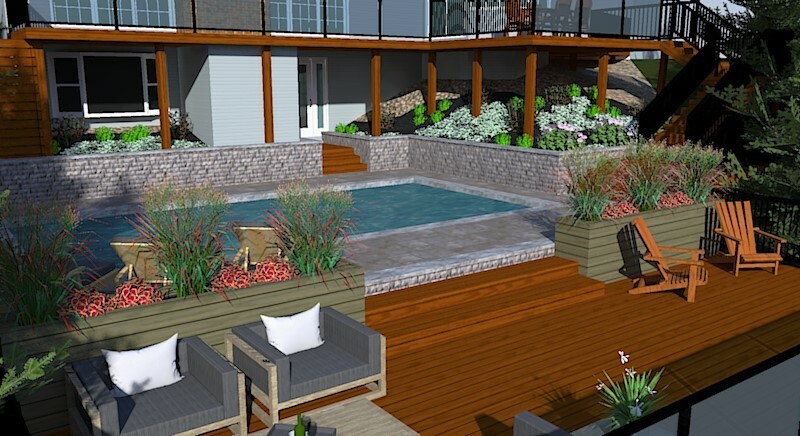 Water features add architectural interest and create a focal point in many designs. However, in our Canadian climate, water features can be a tricky element. Since Canadian seasons have large fluctuations in temperature, some water features require ‘winterizing’ and run the risk of damage due to cold temperatures if not done properly. Nonetheless, there are water features that are better suited for our climate. Stayed tuned for a future blog explaining water features in much more detail to help you choose the right one. Whenever considering a water feature as a design element, you must give though to a few aspects before choosing and installing your water feature. Choosing the right location (not beneath trees that will drop leaves and debris, or in an area with a lot of wind) and considering proper scale. A water feature should be in keeping with the home and tie into all other elements without being intrusive. How big will the structure be? What is the purpose of the structure? As stated earlier, you need to establish if you want the structure to provide shade, rain protection, bug protection, etc. Will this structure fit in your property or will it look out of place?